If readers of the Book of Mormon held to only what the Book of Mormon says, they wouldn’t be mormon. The Book of Mormon presents no doctrines that are uniquely mormon, and explicitly says that there should be no more doctrines than given in the book (3 Nephi 11:40), yet the LDS prophets came out with a whole new set of doctrines contained in their books of “Doctrine and Covenants”, “Pearl of Great Price”, and multitude of scriptural sermons including Journal of Discourses. That doesn’t seem to leave much room for additional doctrine, does it? The Book of Mormon doesn’t even talk about the LDS’s biggest unique doctrine, their temple work! There is no even any mention of baptism for the dead, another of their unique doctrines. If the Book of Mormon were written “for the latter day”, as why wouldn’t they have any of the most differentiating mormon doctrines? If there is no mention of uniquely Mormon doctrines in the Book of Mormon, then why do the LDS missionaries have potential converts pray about the book to determine whether the book is true? If the LDS temple ceremonies are supposedly old ceremonies that were restored, why is there no mention of temple work in the Book of Mormon? The simple explanation seems to be that when Joseph Smith wrote the Book of Mormon he hadn’t gotten the idea of the new temple ceremonies. Joseph Smith didn’t come up with baptisms for the dead until later, and he didn’t come up with the masonic based temple ceremony until less than 2 months after he became a Freemason. This also explains why much of the LDS temple ceremony is an exact duplicate of what is done or said in Freemasonry. Brigham Young advocated in multiple sermons that people should be killed for committing certain sins, because Christ’s sacrifice was not enough to cover for these sins. This is also known as the mormon law of Blood Attonment. The sins that the mormon leader considered to fall under Blood Atonement even included black interracial marriages, and apostasy from the mormon church. There seems to be a direct link between Brigham Young’s sermons, which are recorded in LDS scripture, and the murder of over 100 innocent people by mormons and their church leaders, in the Mountain Meadows Massacre. As pointed out in other articles, the Journal of Discourses has been considered scripture for many years, and though they try to distance them selves from it mormon leaders still categorize it as scripture. Even if you don’t want to trust the Journal of Discourses, the same sermon from Brigham Young in Journal of Discourses about “blood atonement” was also printed in the Deseret News. Deseret News was the official church publication of the day, that went out to all the local saints in the Utah area. And an even stronger link between Brigham Young’s words about blood atonement and the Mountain Meadows massacre is that the dates line up perfectly. They happen in the same year!!! The Mountain Meadows Massacre happened September 11th, 1857 (yes this was the first 9-11), and Brigham Young’s sermon on Blood Atonement was given earlier in the same year, on Feb. 8th 1857. All mankind love themselves, and let these principles be known by an individual, and he would be glad to have his blood shed. That would be loving themselves, even unto an eternal exaltation. Will you love your brothers or sisters likewise, when they have committed a sin that cannot be atoned for without the shedding of their blood? Will you love that man or woman well enough to shed their blood? I could refer you to plenty of instances where men have been righteously slain, in order to atone for their sins. I have seen scores and hundreds of people for whom there would have been a chance (in the last resurrection there will be) if their lives had been taken and their blood spilled on the ground as a smoking incense to the Almighty, but who are now angels to the devil … I have known a great many men who left this church for whom there is no chance whatever for exaltation, but if their blood had been spilled, it would have been better for them, the wickedness and ignorance of the nations forbids this principle’s being in full force, but the time will come when the law of God will be in full force. Even if the saints in Utah didn’t hear it directly from Brigham Young’s lips in the tabernacle, they would have had the chance to get the sermon in the Deseret News and read and ponder it for a few months before the Mountain Meadows Massacre occurred. Doesn’t the sequence of events make so much sense? It wouldn’t be much of a stretch to say Brigham Young’s words seem to have had a direct influence on the Mountain Meadows Massacre! Some of the talks quote from Journal of Discourses multiple times. The first talk listed quotes from Journal of Discourses 8 separate times, different quotes! If it wasn’t a valid source for Brigham Young’s word, then LDS General Authorities wouldn’t be quoting from it. But again, the local Mormons in Utah who participated in the Mountain Meadows Massacre probably heard it during General Conference in the tabernacle, or from Deseret News. Can you see how the Mountain Meadows Massacre seems to be a direct result of Brigham Young’s doctrine of Blood Atonement? The LDS Church says their prophet will never guide you astray. In the Bible, Jesus says many false prophets will come, and that we should judge them by their fruits. Jesus says if a tree has bad fruits, the whole tree is bad (see Mathew 7:20-27). Joseph Smith has plenty of bad fruits, such as his lies about his own adulteries, to which the LDS church has recently acknowledged, but had hidden for many years. The current LDS church is not following following true mormonism, and is (according to their doctrines/leaders) in a temporary state where they are not following polygamy, which they say is a “eternal” principle. If you look at all the doctrines of the current LDS Church, polygamy is just temporarily not being practiced right now, but their doctrines still teach it is a true principal. In this chart, you can see the age of the women at the time they were married (and some of them were just 14 years old). “Now if any of you will deny the plurality of wives, and continue to do so, I promise that you will be damned,” (Journal of Discourses, vol. 3, p. 266). “The only men who become Gods, even the Sons of God, are those who enter into polygamy,” (Journal of Discourses, vol. 11, p. 269). “If we were to do away with polygamy, it would only be one feather in the bird, one ordinance in the Church and kingdom. Do away with that, then we must do away with prophets and Apostles, with revelation and the gifts and graces of the Gospel, and finally give up our religion altogether and turn sectarians and do as the world does, then all would be right. We just can’t do that, for God has commanded us to build up His kingdom and to bear our testimony to the nations of the earth, and we are going to do it, come life or come death. He has told us to do thus, and we shall obey Him in days to come as we have in days past” (Journal of Discourses 13:165 – p.166). “This doctrine of eternal union of husband and wife, and of plural marriage, is one of the most important doctrines ever revealed to man in any age of the world. Without it man would come to a full stop; without it we never could be exalted to associate with and become god…” (Journal of Discourses 21:9). Because the Official Declaration only cited the laws of the land as the reason, and not because of God’s commandment, there were many people who simply put them selves outside of the laws of the land (moved to Mexico, etc. ), and continued to practice polygamy. This is why the Fundamentalist LDS Church (FLDS) exists, as they continue to practice true mormonism as preached by the Mormon prophets. It seems that the FLDS can still call them selves Mormons, since they practice all that is preached by the Mormon prophets. If you consider the FLDS under the word “Mormon”, then some Mormon’s do practice polygamy even today, as they follow the words of early mormon prophets, and even LDS mormons accept doctrine that teaches the principle of polygamy, even if they try not to talk about it in public. Joseph Smith is also recorded in Church history lying about his adulterous polygamy. What is considered LDS scripture? “Sixth: The prophet does not have to say “Thus saith the Lord” to give us scripture. The Journal of Discourses was even endorsed by the LDS first presidency. “I am here to answer. I shall be on hand to answer when I am called upon, for all the counsel and for all the instruction that I have given to this people. If there is an Elder here, or any member of this Church, called the Church of Jesus Christ of Latter-day Saints, who can bring up the first idea, the first sentence that I have delivered to the people as counsel that is wrong, I really wish they would do it; but they cannot do it, for the simple reason that I have never given counsel that is wrong; this is the reason.” (Journal of Discourses, vol. 16, p. 161). Many mormons find them selves in a corner because of the terrible things Brigham Young said, such as modern day mormon blood sacrifice (shedding people’s blood who commit certain sins), including killing those in interracial marriages with black people, or killing people who have left the church, but those things are still in LDS scripture today. The mormon’s have a song which they have little children repeat, “follow the prophet! follow the prophet!” and makes no qualifications about when to follow the prophet, just “follow” him. This seems like a rather dangerous proposition, especially considering the some of the abhorrent things that mormon prophets have said. Posted on February 25, 2016 February 25, 2016 Categories Mormon Church HistoryLeave a comment on What is considered LDS scripture? This quote also goes along with Brigham Young’s preaching on Blood Atonment, where he says there are some sins that cannot be covered by Christ’s atonement, and must instead be covered by shedding of the sinner’s blood. Having a child with a black person is one of the sins that Brigham Young categorizes as such. The Journal of Discourses has been considered LDS scripture for many years, and is still sold in the LDS book store. LDS church leaders have admitted that they hide certain historical facts from their members that would not be faith promoting. On top of that, their Book of Mormon, the book that they tell people to pray about to find out if the church is true, really doesn’t hold any uniquely mormon doctrines. The real mormon doctrines are in their book of Doctrine & Covenants, which they don’t tell people to pray about before joining, or in the many other writings of their prophets, such as the Journal of Discourses where you can find that Brigham Young taught that Adam was God, or that there are some sins Christ’s atonement wasn’t enough to cover, such interracial marriages which he considered a terrible sin. 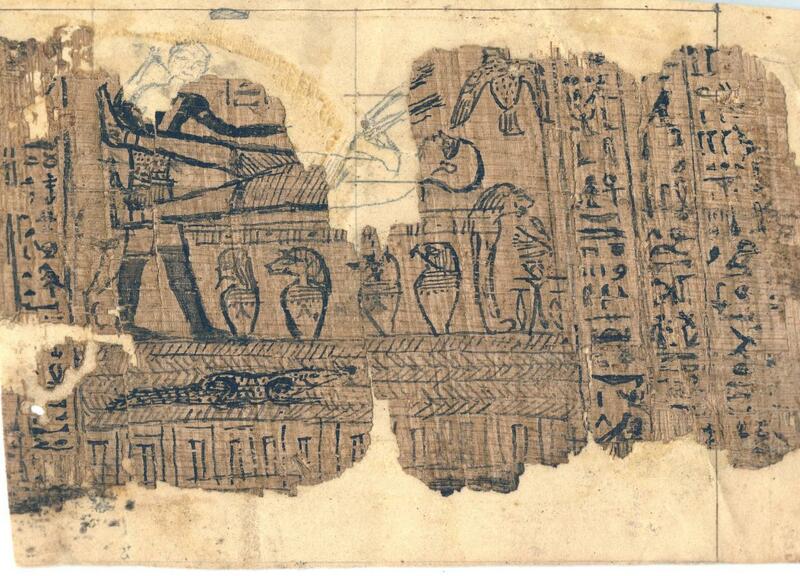 A portion of the papyri used by Joseph Smith as the source of the Book of Abraham. The Book of Abraham is part of the Pearl of Great Price, which mormons consider scripture. The papyri which Joseph Smith said he translated the Book of Abraham from have been exposed to be nothing more than funeral texts from ancient Egypt. The Kinderhook plates were a set of plates which Joseph Smith claimed he was translating, and were later found to be phony plates made by someone trying to test the mormon founder. Mormon temple worship shares an extensive commonality of symbols, signs, vocabulary and clothing with Freemasonry, including robes, aprons, handshakes, ritualistic raising of the arms, etc. Even the symbols on LDS temple garments precisely the same the major symbols of a Freemason, which are tools of a stone mason. Where did mormonism get these?